SWANNY’S MATCH VERDICT: A welcome and deserved win, but where have the goal-greedy Peterborough United strikers gone? Dominic Ball heads the winning goal for Posh against Shrewsbury. Photo: David Lowndes. Former manager Barry Fry once famously showed an interest in signing Jimmy Glass because he ‘always fancied a goal-scoring goalkeeper,’ but there is no Aaron Mclean, Dwight Gayle or Britt Assombalonga in the current squad. Heck there’s not even a Martin Carruthers. There is now another Craig Mackail-Smith of course, but, although the admirable workhorse qualities remain, it’s an older, less destructive version. Posh striker Junior Morias in action against Shrewsbury. Photo: David Lowndes. The Posh goal tally of 45 in 31 League One matches is respectable (although fewer than the 16th-placed Cobblers), but just 14 of those have been scored by out-and-out forwards (just two more than former Posh midfielder Erhun Oztumer has bagged for Walsall), even though manager Grant McCann appears to have used 57 varieties of pairing. It’s an issue that could well become decisive as the race for the play-offs enters the final furlong. Good buddies Lee Angol and Junior Morias were McCann’s Valentine’s Day selection for the visit of in-form Shrewsbury to the ABAX Stadium last night, but, despite playing for 35 minutes against 10 men, it was left to central defenders Ryan Tafazolli and Dominic Ball to score the set-piece headed goals in the final 20 minutes which turned an unfortunate half-time deficit into a deserved 2-1 victory against a team unbeaten in their previous six matches. It was of course a welcome win - the first at home in League One since December 10 - and the effort, tempo of play and character of (almost all) the players couldn’t be questioned, but there remain lingering doubts about this team’s ability to break down committed defences, certainly at home. McCann believes a come-from-behind win could well be a turning point and let’s all hope he is right, although turning Angol into Jimmy Quinn isn’t likely to happen in a hurry. Posh striker Lee Angol shoots at goal during the 2-1 win over Shrewsbury. Photo: David Lowndes. Shrews boss Paul Hurst was in no doubt about last night’s turning point. He felt the decision of referee Carl Boyeson to dismiss on-loan full debutant Stephen Humphrys with a second yellow card for failing to retreat quickly enough at a Posh free kick was an error of judgement as Ball took the set-piece from ‘the wrong place’ and was ‘trying to get our player sent off rather than to pass the ball,’ although he admitted Humphrys, who had converted the 31st-minute spot-kick to give his side an interval lead, also didn’t help himself. Posh may well have won the game against 11 men as Shrewsbury rarely defended with the conviction and organisation they must have displayed in ending Scunthorpe’s 14-month unbeaten home run a few days earlier. McCann thought so and he deserves praise for the bold decision to remove Marcus Maddison for tactical reasons at the interval when his side were a goal down. Maddison, a player who cries wolf when fairly tackled far too often, is a key Posh performer at his best. He wasn’t near that level in his 45 minutes on the pitch last night, but it was still his set-piece delivery that should have led to an early headed goal for Gwion Edwards (Shrews ‘keeper Jayson Leutwiler instead made a fine save), his centre that Morias flicked onto the outside of a post, and he who made a powerful thrust into the visiting penalty area late in the first-half before Leutwiler clung on to a fierce strike. But his replacement Paul Taylor was the man whose corner Tafazolli headed home at the far post on 71 minutes and it was Taylor’s neat turn and cross following a short corner taken by substitute Mackail-Smith that Ball glanced home to celebrate the first senior goal of his career eight minutes later. Posh centre-back Dominic Ball in action against Shrewsbury. Photo: David Lowndes. McCann started the game playing with a 4-4-2 formation and switched to 3-4-3 soon after the red card. His players were clearly sent out to move the ball quickly with longer passes to two bustling, busy strikers much in evidence. Morias cracked two thunderous shots at goal in the first period, left-back Jerome Binnom-Williams missed the target badly after Tafazolli had nodded a first-half free kick into his path, while Angol sent a decent headed opportunity over the crossbar straight after Humphrys’ dismissal. Taylor curled an effort wide after cutting inside from the left flank on the hour mark, before Shrewsbury were finally broken down. The direct running down the right wing of Edwards was particularly impressive as was the cool, experienced midfield play of newcomer Anthony Grant which helped Posh see out the final minutes rather comfortably. Home ‘keeper Luke McGee certainly enjoyed a quiet night. He almost saved his second Shrewsbury spot-kick of the season after Michael Smith had handled a right-wing cross from Shaun Whalley at the far post. Otherwise Tafazolli, Ball and co did the main part of their job description adequately. Those who play furthest forward need to start doing the same. 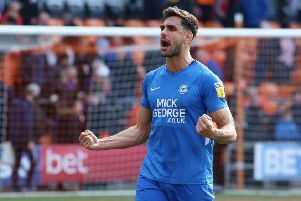 Posh: Luke McGee, Michael Smith, Jerome Binnom-Williams (sub Craig Mackail-Smith, 63 mins), Dominic Ball, Ryan Tafazolli, Anthony Grant, Chris Forrester, Gwion Edwards (sub, Leo Da Silva Lopes, 82 mins), Marcus Maddison (sub Paul Taylor, 46 mins), Junior Morias, Lee Angol. Unused substitutes: Tom Nichols, Jack Baldwin, Mark Tyler, Martin Samuelsen. Shrewsbury: Jayson Leutwiler, Joe Riley. Matt Sadler, Arostote Nsiala, Shaun Whalley (sub Ryan Yates, 65 mins), Junior Brown, Gary Deegan, Bryn Morris (sub Ryan McGivern, 85 mins), Louis Dodds (sub Tyler Roberts, 79 mins), Stephen Humphrys, Alex Rodman. Unused substitutes: Mark Halstead, Adam El Abd, AJ Leitch-Smith, Jack Grimmer. Goals: Posh - Tafazolli (71 mins), Ball (78 mins). Shrewsbury - Humphrys (pen, 31 mins). Sending off: Shrewsbury - Humphrys (second yellow, failing to retreat at a free kick). Cautions: Posh - Ball (foul). Shrewsbury - Rodman (foul), Humphrys (foul), Morris (foul).